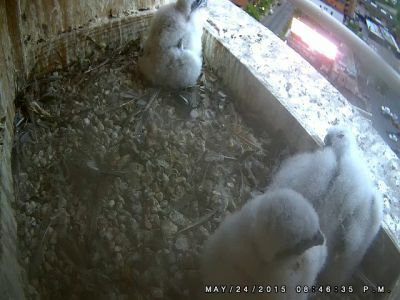 The Kalamazoo Peregrine family is in for a big surprise this week. The Michigan Department of Natural Resources (DNR) plans to band the four chicks on Wednesday, 5-27-2015. Banding allows for the identification of these falcons in the future. The band numbers will provide their identity, their parents, the date and location of hatching, and the banding date. Identifying their gender is a best guess situation. Typically females are larger than males, so the banders will use size as a guide to gender. But, we know that the size of these birds is impacted by the differences in hatching dates, as we have all been watching and routing for "Tiny." The parapet cam is now live stream, and we will ask the banders show what they are doing, while maintaining safety for themselves and the birds, the prime priority. The banding should start shortly after 8 AM.